The layers of history in a particular place fascinate me. In May of 2016, I travelled to the Boyne Valley in Ireland. I visited several prehistoric sites, which over time, had changed into Catholic shrines. In preparation for the trip, I recalled my travels in the UK and Ireland in the 1990s and prepared four papier-mâché pheasants. 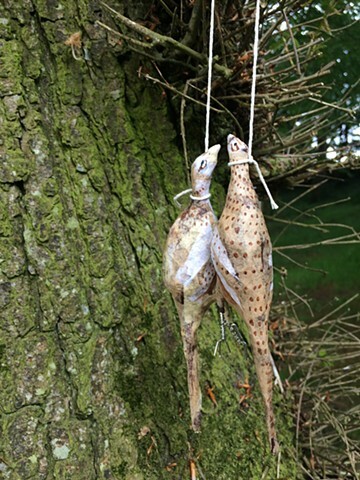 These pairs of birds, two females, and one male and female, are hanging from strings as if they were killed in a hunting party. I chose to leave the females here as offerings at Saint Brigid’s Shrine in Faughart, Ireland.